According to many international human rights organizations, the EU’s policies for dealing with this humanitarian emergency have been dismal. Within Germany, the Chancellor, Angela Merkel, has been particularly sharply criticized for failing to respond quickly and effectively enough to this crisis. In the midst of all this criticism, the Chancellor has received an unusual vote of confidence from an unexpected source. As a sign of her gratitude, 26 year old Ophelya Adé, an asylum-seeker from Ghana, named her newborn baby daughter Angela Merkel Adé. 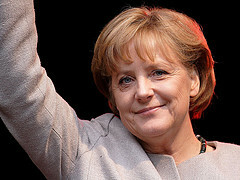 When asked by the naming authorities in Hanover why she had chosen that name, Adé replied that she liked Merkel. Whether the new Fraulein Merkel will be allowed to remain in Germany along with the other 750 foreigners who have applied for asylum in Hannover remains to be seen. Click these links for more information in English and in German.